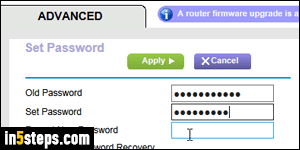 Since every Netgear router in the world has a username of "admin" and a default password of "password", changing that password as soon as possible is a good idea. As you'll see, it's very easy to do, and all you need is a web browser. You can also do it using the Netgear Genie app for Mac / PC / iOS / Android, but I'll go the web browser route in this tutorial - it's just as quick! 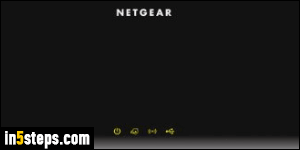 If you haven't logged into your router before, see the "Login to Netgear router" tutorial, then come back on this page. 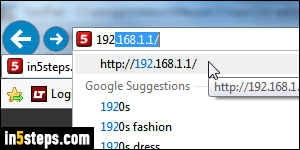 Quick refresher: open your favorite web browser, type 192.168.1.1 in the address bar at the top, and hit Enter. Once on your Netgear router's home screen, the Basic tab will automatically be selected. Click on the Advanced tab. Then, select Administration on the left. Click on Set Password, and type your current password under Old Password. If it was never changed, it will just be "password". Then, enter your new password twice: it is case-sensitive, so make sure that Caps Lock (all caps) is turned off, and pay attention to capitalization. Ideally include a mix of upper- and lower-case letters, numbers, and symbols to make it harder to guess. If you forget your password, you'll have to completely reset the router to regain access to it. For this reason, Netgear includes a set of security question and secret answers you can use in that case. 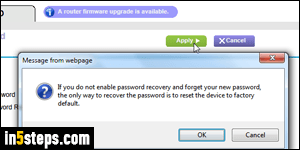 Check the "Enable password recovery" checkbox to set those up. Pick two different questions from the first and second dropdowns, and type the corresponding answers in the text fields. Click on the Apply button at the top to save your new settings - you are done!